Browse these historical, physical, and TX regional themed framed Texas maps, part of our Texas History collection. Whether you are looking for Texas office decor, or something to give as a very special graduation gift, these custom framed maps will be proudly displayed. Choose from hand illustrated city maps of Houston, Austin, Dallas, or Fort Worth. Or discover the old west with our cattle trails map of the 1800s. Or select a Republic of Texas, Texas revolution or a Texas battle map depicting the numerous military campaigns that took place in Texas from independence to today. 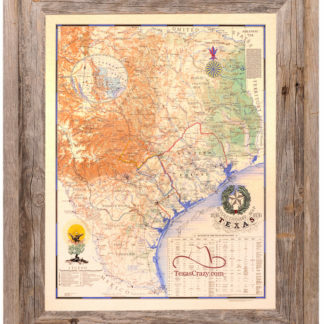 Reclaimed Wood: Texas Crazy is invested in using recycled products as appropriate for our custom framed artwork including Texas maps. Several years ago we began to recognize the character and beauty found in reclaimed wood that is superior to many brand new frame styles. So we pursued adding that to our product line as a way to be environmentally responsible. We began to recognize that the character flaws of each discarded piece of old wood was not a thing to be eradicated, but a thing to be emphasized and featured. While we also offer more traditional custom frames as well, we think you’ll be really pleased where you design a Texas themed home or office décor using our reclaimed wood artworks and complementary decorating accents. They reflect the toughness of Texans and our American way of life despite the storms we all face. Lamination of Texas Maps: Don’t know about you, but I hate to look at a map under glass. Despite the advantage of glass costing less, the secondary glare, glass image distortion, and the way colors are muted somehow is less pleasing to me. A number of years ago, we were introduced to the wonders of map lamination. While you can special order without, most of the framed Texas maps we offer come standard with map lamination, which fixes all three issues, not to mention the possibility of glass breakage in shipment. Compared to glass, colors seem to pop better, you can actually get closer to the map surface for closer inspection, and the laminate we use has a matte finish, so the glare is substantially reduced. Plus lamination keeps your Texas map surface protected from oil naturally occurring on your hands. Incidentally map laminates also partially protects from UV rays of the sun, which is why we never recommend placing any artwork in direct sunlight or strong daylight, glass or laminate.